I’ve brought several high-profile “shorts” to your attention since we started Total Wealth, and I hope you’ve racked up some big gains by following along. First, there was Twitter Inc. (NYSE:TWTR) (here). It has fallen 40% from the recent highs of $52/share (in April) and was down 14% this morning after earnings, now trading around $31/share. This trade still has a long way to go, given how poorly run the company is, not to mention the revolving C-suite door. It’s probably worth less than $10 at best. Then there was Shake Shack Inc. (NYSE:SHAK) (here). I warned you within hours of it hitting a post-IPO peak of $96.75/share (in May) that the thing was a dud. It fell 50% to a low water mark of about $48. It’s back up to $61 or so as I write this, which means there’s plenty of fresh money for the taking and an entirely new group of shareholders for whom hope is an investment strategy. I still see it valued at no more than $0.66, using industry metrics. Now I want to bring another opportunity to your attention. This stock is even more insanely valued and has metrics that suggest it’s an even better, more profitable trade. Right now it’s trading at $41/share and is probably worth no more than $1.36. Absolutely. Like Twitter, Shake Shack remains totally overvalued and that means there’s a lot of room to the downside. The problem is that shorting Shake Shack is now a “crowded” trade, meaning a lot of people now know how badly overvalued the company is. Goldman Sachs and Morgan Stanley have also piled on, observing – like we have – that the company’s fundamentals do not support such lofty prices. That’s why, in keeping with the Total Wealth Tactic of Looking Where Others Are Not, the better play is another trade that’s less well known, yet still has every bit of the profit potential and then some. I’ve made no bones about my views on Shake Shack. The company makes great burgers but does not have the underlying numbers, growth, or menu needed to support a price that is still 339x forward earnings at $55 a share. Neither does Zoe’s Kitchen Inc. (NYSE:ZOES). And its PE is even worse. The snazzy Mediterranean joint – which makes delicious pizzas, wraps, salads, sandwiches, and kabobs for its customers behind plate-glass assembly lines within minutes – has been called “the Chipotle of its industry” by Yahoo! Finance and other mainstream investing outlets. Zoe’s Kitchen epitomizes how conventional fast food is losing market share to an up-and-coming style of restaurant – the “fast casual” – that occupies a niche in-between hamburger joints and formal eateries. Analysts’ adulation is just one of many things Zoe’s Kitchen has in common with its fellow media darling and hype-stock du jour, Shake Shack. However, even as Shake Shack has been drifting lower towards increasingly realistic valuations, Zoe’s Kitchen has surged more than 34% since early June. The result is a ridiculous price-to-earnings (PE) ratio that puts Zoe’s on par with where Shake Shack was in May when I called it for what it was, despite the company’s status as a media darling. Most investors focus exclusively on buying stocks in an attempt to capture huge returns. That’s too bad, because it means they restrict themselves to half the opportunities available to them. George Soros, for instance, is reported to have made $1 billion in a single trade that famously almost broke the Bank of England in 1992. John Paulson made billions from the housing crisis when it hit by betting against the grain. Doug Kass of Seabreeze Partners is famous for bucking conventional wisdom on seemingly mighty companies and laughing all the way to the bank. But don’t think this is something for the big money alone. Individual investors can use this tactic too by selling short, buying inverse funds, or using put options. As for how it got there, that’s the thing – Zoe’s is being driven by exactly the same hype, hope and irrational exuberance that made Shake Shack such a great short play. For instance, Zoe’s shot higher on earnings of only $0.04/share on June 5th that surprised analysts who had expected another loss for the young company that’s been public for barely a year. SHAK’s earnings were also $0.04 per share. Zoe’s PE ratio is now 1,192. SHAK’s PE ratio on the heels of its widely celebrated earnings report was also above 1,200, which, as I pointed out to you at the time, was an enormous red flag to any investor considering buying the stock. To put that in context, the restaurant sector carries an average PE of 40.5, according to NYU’s Stern school of business. 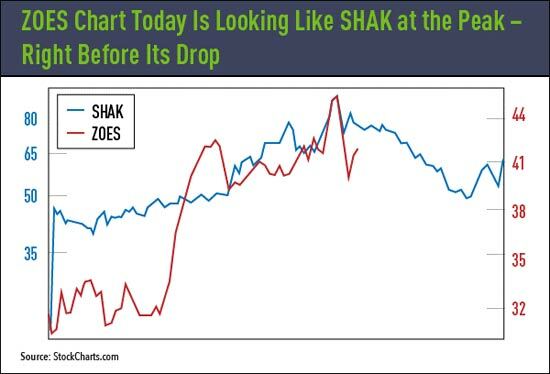 That means Zoe’s Kitchen’s stock is 30x more expensive than the industry as a whole – and like Shake Shack – ripe for an eye-watering correction that takes to down 96.7% to only $1.36 per share. The same way I arrived at $0.66 for Shake Shack – by using industry comps. Then there’s the trading itself. As you can see from the following chart, Zoe’s is on a very similar trajectory. To hear the Zoe’s bulls tell it, the company will “grow” into its valuation. The implication is that “everybody else” is just too stupid to see that. It’s classic Silicon Valley/Wall Street logic and arrogance. It’s also exceptionally dangerous for your money. Growing into a valuation is something best left to tech companies like Apple Inc. (NasdaqGS:AAPL) or Tesla Motors Inc. (NasdaqGS:TSLA) – companies with the potential to change the world. Not a company that sells marinara on a pita or a burger and fries for that matter. Remember, every company has two kinds of shareholders, and companies like Zoe’s make that abundantly clear. There are long-time investors who believe in the brand; they’re owners. They rarely, if ever, sell. And there are flippers who buy and sell the stock on a whim. They’re usually “in” because they got shares at the IPO or as part of the early stage funding. They rarely give a damn about anything other than their money. It’s a classic trap and one Wall Street uses very effectively to separate millions of unsuspecting investors from their money under the guise of growth and huge profits down the line. Only this time you have what you need to make money when it’s sprung. Exactly as you did with Twitter and Shake Shack. Is this a recommendation or not. Very interesting analysis. What is your recommendation on puts rather than shorting”? Thank you for the kind words, Charles. That depends on your individual risk tolerance and capital. My suggestion is to begin by selecting puts that are at the money or one strike in the money to bleed off time decay. From there, choose a length of time that matches your expectations. Mine are that this trade takes 3-6 months to play out, for example. Obviously, stops apply just like any other trade or investment in case the markets have other ideas. You’re welcome. I’d suggest splitting the trade up into chunks – kinda like dollar cost averaging only in reverse. That way you’re not at risk of a single big move up or down but can, instead, capitalize on the inevitable fight that will happen before bulls give up the ghost. You lost me at “pizza joint.” Zoe’s kitchen is a Mediterranean restaurant. They don’t even have pizza on the menu. Zoe’s has pita pizzas, but you’re right that they’re better known as a Mediterranean place. Thanks for pointing it out! Are Facebook (early) investors “tight hands” or owners of Facebook (FB) who believe in Mark Zuckerman’s vision, whatever that is? Or, are they largely speculators who intend to sell at some point down the road. Facebook is building a business based on obtaining (increasing) advertising dollars as byproducts of their various acquisitions such as 3D Gaming ( Oculus). I don’t use any social media, so I can not tell how much is a fad and how much has real staying power and the ability to “change the world”, as you say. Can you help clarify where Facebook stands as a company and investment, as it currently has evolved as IPO ? To me, FB currently appears to be quite a speculation, especially at today’s valuations. Facebook is hopelessly overvalued by every metric available to me. However, hopium powers the stock which means that you don’t want to fight the tape so to speak…at least not yet anyway. For now it is well capitalized and Zuckerberg, to his credit, seems to be listening to some very smart advisers rather than making impulsive deals as was the case early on. Is there a recommendation to be considered? What’s the current thinking on EKSO? Still a great company making the right moves needed to build a very viable and profitable longer term investment. I’ll have more down the line. After being fed up with being a bagholder on 2 biotechs I have just opened a spreadbetting account in the UK and am loving it. Just made my first short sell on an equity today shorting GILD after opening. For just 2hrs, and a paltry $2.20 drop I made more than I would after an 8hr day at work so I’m definitely up for it. Now that’s a very diplomatic way of stating how Wall St and Co like to pump and dump! Big thanks Keith and keep those short recommendations coming. Hello Gabriel and thanks for the kind words. I’ll do my best! any literature that you would recommend for me to get so I can learn all the terms and what they mean and all this trading stuff I do want to learn and make money with your help. Thanks again. There are no stupid questions when it comes to money. I am very proud that you have asked. The fact that you are here puts you ahead of most investors who make no effort to understand the world around them and, predictably, wind up with terrible results. Shorting is the process of selling a stock before you buy it. There’s a good explanation here. You may also wish to check out http://investor.gov/investing-basics which, believe it or not, is one of the few government websites that actually is worth visiting. Of course, please continue to read Total Wealth. The great comments and shared influence of hundreds of thousands of investors can help, too. Should I buy August puts now before Goldman Sachs makes a recommendation to the market? And so… ? Do you have any specific entry or exit points…. specific options in or out of the money… time frame …. stops or upside levels of exit…. What is your recommendation on puts rather than shorting”? That’s something that depends entirely on your personal risk tolerance and objectives. I believe the trade is well set up at the moment even if Goldman Sachs doesn’t make a play. Same arguments were made against Chipotle (CMG) and it has slaughtered the shorts time after time. I’m not calling ZOES another CMG, just don’t see trying to pick a top here as a prudent investment. The Japanese Yen was known for a long period of time as the “widow-maker” because it broke every short attempt against it. Then, for the same sorts of fundamental reasons, it collapsed and anybody who hadn’t given up has made bank. I see the same thing here given how aggressively the SHAK has been bid up. Chiptole never attracted that kind of attention…at least from me anyway. So the two trades appear very different to me. But, there are always two opinions and that’s what makes this business so exciting. By the way, I love the fact that you chose the word “prudent” because it speaks highly of your character and the approach you take. Are you still recommending ACAD (Acadia Pharmaceuticals) as an overvalued stock worthy of SHORTing ? Since your article on 3 shortable stocks (ACAD, PAWN & SHAK) it has mostly gone UP & UP. ACAD has definitely gone against expectations. As much as I wish I could be right on every trade, this doesn’t appear to be one of them. At least not yet any way. I still think it’s a great short, incidentally but it may take a few tries to get properly situated depending on your personal risk tolerance and objectives. But that’s not necessarily a bad thing. Professional traders often take 3, 5, even 7 shots at a stock before they get the position they want prior to a move. Hi, this is Janet, not to change the subject, but, I an loosing alot of money with ekso, you don’t talk about it. Are you still sayinG HOLD????? Sorry that you have the impression that I am not talking about Ekso any longer. In fact, I continue to watch it very carefully and will, as I have noted numerous times, let everybody here at Total Wealth know if there’s anything that changes my view on the company. In the meantime, it’s still a very promising small cap working in key market segments that are closely tied into our Unstoppable Trends. As such, the volatility is completely in line with expectations and other companies at that stage of their development. If you’re losing sleep over Ekso or otherwise worried about it, I would submit that perhaps you’ve allocated too much money to the trade or that it’s not properly aligned with your personal risk tolerance. Every investment involves risk of loss, even Ekso. Ask your financial adviser for help if you need to. Or, go back and revisit some of the Total Wealth columns on position sizing and risk management. It would interesting to see replies to some posted comments. That’s my fault – between our boys, travel, family and all the usual summer stuff, I simply haven’t had as much time as I would like to reply. I’ll do better! This is off the subject but I want to say that as I observe your communication with everyone in this string and many others, along with your interviews in the financial media, I admire and have great respect at how well you maintain your professionalism and kindness even when some questions or comments towards you may tend to have a lack of respect. The folks here have not been too bad but I have see some rough ones coming at you before and yet you seem to always stay in control. I know that I can learn a lot from you on this investing journey but I’m also beginning to realize that I’m learning a lot just observing your disciplined character. With great respect my hat is off to you sir. I cannot tell you how honored and humbled I am by your comments. You made my day and I appreciate your thoughts tremendously. For the beginners (like myself), could you provide specific instructions on what to do with what your are recommending here. I’ll contact my brokerage (Folio) and ask if the can assist me. Thanks! My account is at Ameritrade and they tell me that they don’t have shares of ZOES available for short sells. ??? hey Keith, what stocks are worth investing at this moment. I’ve got two stocks that are taking a pounding but I think their fundamentals are good. Can you please comment on ARIA and VNR? I tried to short 2,500 shares of ZOES through my TD-Ameritrade account and it would not accept my order. It says that this stock is not available for short selling. Does this speak volumes about your prognostic this stock is ripe for a fall? Or is there something more I need to understand (maybe about how TD-Ameritrade works)?